If you love peanut butter and chocolate these Smoothies are perfect for you. 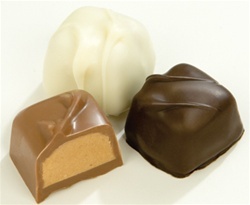 Soft textured p/b center enrobed in either milk, dark or white chocolate. An all time favorite are these Peanut Butter Smoothies. This is probably our #1 seller at the store. Delicious soft center of peanut butter that melts in your mouth enrobed in rich chocolate. CAUTION -- If you buy these PB Smoothies, you will become a frequent buyer.